Tennis betting is a type of sports betting where gamblers bet on the outcome of a tennis match. For some South Africans, watching a game of tennis is a great way to unwind. But for others, it is all about the excitement. Either way, tennis betting engages the gambler in the game and creates even more anticipation for the outcome. In sports betting for different sports, there are common types of bets which gamblers can place. This is no different in tennis betting. Bettors should always ensure that they know exactly what specific bets mean so that their bets can reflect what they are predicting. 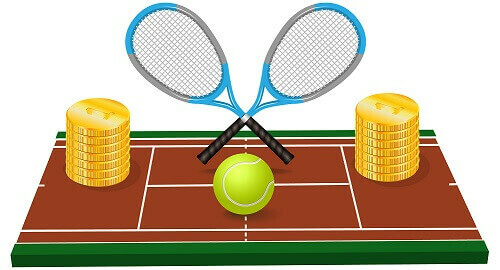 Below are some of the types of bets which can be placed in tennis sports betting. This type of bet is very straightforward. The wager is placed on the person the gambler thinks will win the match. This bet very useful when one player is much stronger than his/her opponent. It focuses more on the performance of the player, rather than the actual winner. Predetermined points are added (underdog) or subtracted (favourite) to the players’ final scores to ensure fairer bets with a less predictable outcome. This bet allows gamblers to bet on the number of sets that will be played. Gamblers can bet under or over 2.5 sets for example. If there are three sets in the match, gamblers with an over bet win (so, those with an under bet lose) and vice versa. This bet is similar to set betting. If a gambler wagers on over 31 games, and the outcome than 31, they win. Whereas, if the games are less than 31, they lose. This bet allows players to wager on who they think will win a tournament. Many South Africans enjoy the thrill of tennis betting as it allows them to engage with a sport they enjoy. If tennis is not your cup of tea, why not try other types of online sports betting such as soccer betting and horse racing.